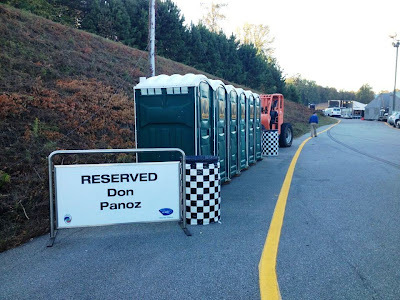 One Hot Lap: Reserved for Don Panoz! Hat Tip to Craig G.
We knew the Panoz chassis is fantastic. Now we know that Don Panoz is quite a guy too! We are looking to confirm that the checkered trash cans on both sides of the cordoned off area indicate these are high speed porta potties built on the newest Panoz chassis. If you have any news updates on this, please send them along.